Depending upon what part of North Carolina you reside in, you may experience tons of precipitation, with lots of snowfall occurring in the mountain regions and heavy rains periodically through most of the state. No matter where you are within North Carolina, a metal roof is an ideal choice for your home or office building. Why metal roofing in North Carolina? It is able to withstand high winds of as much as 120 mph. With the option of many styles and colors, there is a product for both historical and modern architectural designs. Most of our products come with a 30 to 50 year warranty. All of our roofing is environmentally friendly. It was constructed using over 56% of recycled metals and can be recycled at the end of your roof’s lifespan. Lowers energy costs for both heating and cooling. Many styles qualify for the Energy Star tax credit. We serve Asheville, Cape Hatteras, Charlotte, Fayetteville, Greensboro, Raleigh, Wilmington and every North Carolina town and community in between. Speak with our customer service department to find the right roofing product for your project. 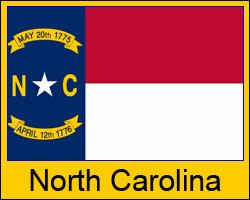 We service every area in North Carolina and will deliver your order to the job site for your convenience. All listed prices are valid for any area within the state although some shipping restrictions do apply. Click here for details on shipping to your job site.